When companies are willing to take individuals to court for illegally copying movies, music and software, how is it that it's possible to get some programs for free? If they're being given away then they must be inferior or riddled with adverts – right? When it comes to open-source software, the usual cynical rules don't apply. This stuff is genuinely free and much of it is very good. Some of it is better than its commercial alternative. By publishing the source code, the software is open to wide scrutiny and so, in theory at least, it should be safe, secure and constantly improved. Practically everyone's heard of this browser. The world's second most popular web browser is often said to be more secure than IE and it's definitely more flexible. Due to its open-source credentials, there are hundreds of extensions available to improve security or add extra functions. Firefox gives you the web just the way you want it. If Firefox is a replacement for IE, Thunderbird is a replacement for Windows Mail/Outlook Express. People choose it over Windows' default option for more security or because it's available in Mac and Linux versions. It also supports extensions and there are a variety of message templates to use with it. 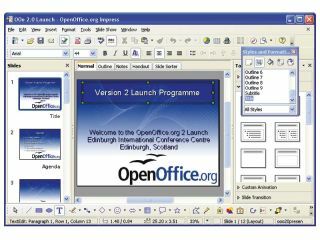 OpenOffice.org is a free alternative to MS Office, replacing Word, Excel and PowerPoint with its own apps that can open Office files and save to the same format. It doesn't provide alternatives for Access, OneNote or Outlook, but there are other open- source apps you can substitute for these. The GNU Image Manipulation Program provides a free alternative to Photoshop or Paint Shop Pro. You can carry out complex graphics tasks using it and it supports multiple layers. Anything that can be achieved in Photoshop you can do in The GIMP. Its drawback is that it's a little tricky to learn. Hugin matches pricey photo-stitching tools in terms of functionality. When you're on holiday and come across a beautiful view, it can be frustrating to find that your camera can't squeeze it all in, even if you use a wide-angle lens. Traditionally, we've attempted to overcome such problems by taking a series of images from left to right and then trying to line up the prints to recreate the view back home. Digital photography makes it possible to stitch the images together in a more seamless fashion, but it's a tricky job in a photo-editing application and specialist software for generating panoramas can be expensive. That is, unless you use Hugin, which is an open-source application and as such, totally free. Hugin works by loading up a collection of images in the correct order and then identifying common areas in each image. The more overlap there is, the better results you'll get. Hugin can resize images to fit them together better and it can alter the brightness and contrast so they match. You can choose the kind of lens to use for the final image: a normal image, a panoramic, cylindrical one or a fisheye lens. Your selection determines the shape of the final image. The Assistant tab makes producing panoramas very easy indeed. You can find out more about the program by going to http://hugin.sourceforge.net. Here you'll find a collection of handy tutorials, an extensive manual and a list of FAQs.Hugin produces a high- quality TIF panorama that you can view in any image application. Celestia can bring the stars, moons and planets to your desktop. It's a lot like Google Earth for the skies, giving you access to the known parts of the galaxy within a computer-generated environment. When you start the program you'll see planet Earth in its current orientation.